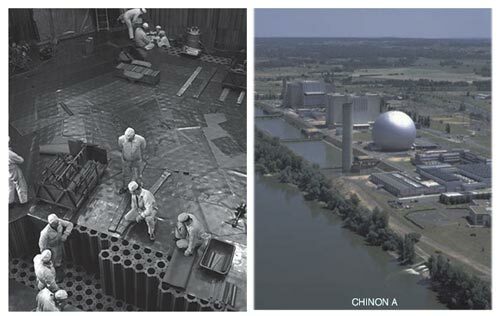 The photo on the left shows the stack of graphite blocks at the Chinon nuclear plant when it was being built. The stack is an array of columns made of hexagonal graphite bricks arranged in layers: they are hollow to allow the fuel elements to be inserted. The reflector, made from the same type of bricks, though not hollow, is around the edge. Underneath the stack there is a support area, also made of graphite, which provides biological protection. These materials, which will become waste, are in reactors A1, A2 and A3 at Chinon, and A1 and A2 at Saint-Laurent des Eaux, and in the reactor at Bugey.